These Politicians Are Vying To Succeed Germany's Angela Merkel Chancellor Angela Merkel will step down as Christian Democratic Union leader next month. Here's a look at the contenders to lead the party — and likely become its next candidate for chancellor. 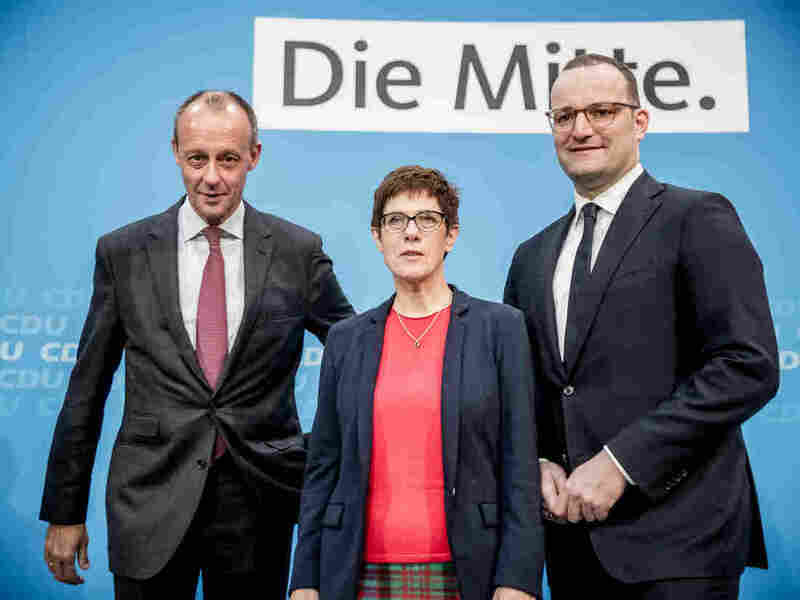 Annegret Kramp-Karrenbauer, the Christian Democratic Union's general secretary, stands between health minister Jens Spahn (right) and Friedrich Merz (left). The three politicians are vying to become Chancellor Angela Merkel's successor as CDU party chair in December. After 13 years as Germany's chancellor and 18 years as leader of the Christian Democratic Union (CDU), Angela Merkel announced the end of her political career in October. She will step down as CDU leader next month, while remaining head of the government until 2021. Minutes after Merkel's Oct. 29 announcement, the fight — so far, a very polite one — over her succession began. The next CDU head will also likely become the party's next candidate for chancellor. The new leader will be chosen by delegates at the CDU party conference in Hamburg on Dec. 7. Until then, candidates are crisscrossing the country, trying to drum up as much support as possible. The party has planned a series of eight regional conferences, allowing the candidates to make their case. The most recent polls suggest a tight race between Friedrich Merz, a conservative businessman and former CDU politician, and Merkel loyalist Annegret Kramp-Karrenbauer, assigning better chances to Kramp-Karrenbauer. Jens Spahn, Merkel's health minister, is running a distant third. "The fact that the members have a choice between three excellent candidates stimulates the party a lot," Paul Ziemiak, chairman of the CDU's youth wing, Junge Union, tells NPR. "There is much discussion going on at the base and we benefit from that." Nicknamed "AKK" — and "Mini-Merkel" by her critics — Annegret Kramp-Karrenbauer is considered the chancellor's favorite candidate to succeed her. A recent poll shows Kramp-Karrenbauer with a clear lead and support from the party base. 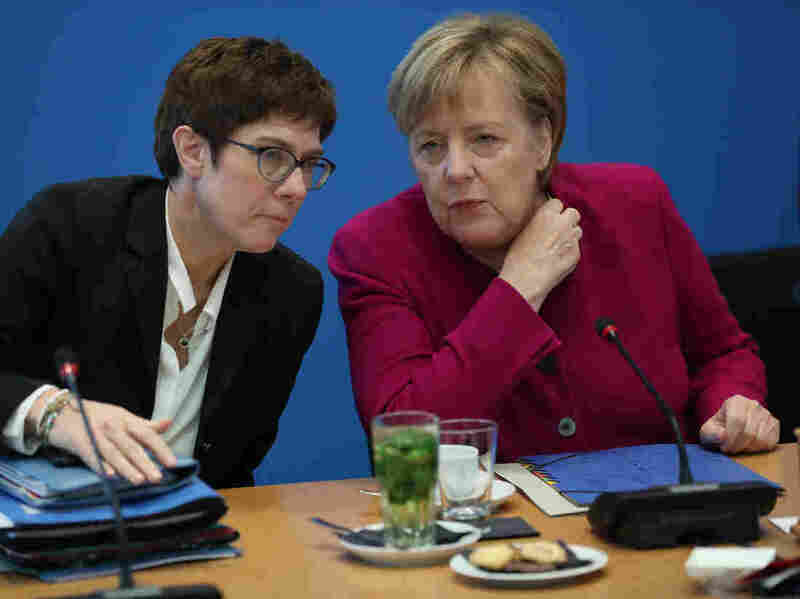 A former prime minister of Germany's Saarland state, Kramp-Karrenbauer impressed Merkel by winning re-election in March 2017 from an almost hopeless position, defending her position and even gaining new votes when a change of government was widely expected. German Chancellor Angela Merkel chats with CDU General Secretary Annegret Kramp-Karrenbauer in Berlin last month. Kramp-Karrenbauer is among three leading candidates seeking to run the party next month. The 56-year-old became general secretary of the CDU in February and has garnered support among the party base in recent months during a national listening tour. She emphasizes social issues and equal opportunity, and recently referred to poverty in Germany as a "social explosive device." Considered closest among the frontrunners to Merkel's politics, Kramp-Karrenbauer is now trying to differentiate herself from the chancellor, especially when it comes to Merkel's deeply unpopular refugee policies. "The one big reservation about her is her having worked very closely with the chancellor — that's her drawback," says Werner Weidenfeld, a political scientist at the University of Munich. "After the era of Merkel, people are longing for a new era." But Jürgen Falter, a political scientist at the University of Mainz, believes that Kramp-Karrenbauer has the best chance at winning the leadership race because of her strong support among party delegates, even though Merz may have broader CDU support. "If all of the CDU members could vote, probably Friedrich Merz would have the best chances," he says. "But among the delegates of the party congress, there may be more AKK supporters." A comeback for Friedrich Merz? Merz, a financial expert seen as upholding conservative and traditional values, is a familiar face on Germany's political stage. He quit active politics 10 years ago, after a power struggle with Merkel, who sidelined him in 2002 as parliamentary floor leader. Seven years later, he opted not to run for reelection. Merz, 62, has had a strained relationship with Merkel ever since. A strong proponent of economic liberalism, he turned to the business world and for the past decade has primarily worked as a corporate lawyer and chaired several supervisory boards. As chairman of BlackRock's German asset-management unit, he has been in the spotlight and under fire of late. German prosecutors are investigating the investment corporation for controversial tax transactions from 2007 to 2011, a period that precedes Merz's time there. "He promises an end to the Merkel course, has a touch of charisma and promises neo-liberal business modernism with a firm anchorage in a traditional conservative Leitkultur [guiding culture]," Wolfgang Merkel, a political scientist in Berlin (and no relation to Angela Merkel), tells NPR. "He embodies the correction of the Merkel course of the recent years with most credibility." But Weidenfeld says Merz may face difficulty due to his association with BlackRock: "His past in the business world, being chairman of the board at BlackRock, makes his candidacy unpredictable. In the end, the way the media covers his past of working in the economy, will determine his outcome. If this remains the top issue — even if he never got his hands dirty himself, he will not be able to win the race." From the U.S. perspective, Weidenfeld believes Merz could be the best candidate to succeed Angela Merkel: "He is an expert on the transatlantic relationship, believes it to be the key link ... concerning world politics. He does everything to establish a reciprocity of perspectives and brings along many years of experience. It is likely that Merz would take a step toward the U.S. on many issues." Spahn has distinguished himself as a conservative critic of Merkel, while serving in her government as health minister. The openly gay 38-year-old, who married last December, has polarized opinion, even within his own party, with his statements about refugee policies. He was among the first politicians to openly criticize Merkel's immigration policy and complained last year that "too many people believe that every other culture is an enrichment per se." This may cause problems for his candidacy, analysts say, because anyone who wants to win the majority of the party congress must integrate all wings. Spahn has made a poor showing in polls so far. "The reason for his bad showings in the opinion polls can be found in the role he had when Merkel was still in full power," Weidenfeld observes. "He got known as somebody who openly dissociated himself from the chancellor and frequently criticized her. That momentum once made him big, but vanished with Merkel announcing the end of her career." A more conservative, isolationist CDU? No matter who succeeds the chancellor, political scientist Wolfgang Merkel foresees an increasingly conservative direction for the CDU. "There will be no fundamental change of the general course, but a correction," he explains. "More tradition, less liberal modernity, a more business-friendly policy. More isolationist policy against refugees and migrants. No new initiatives in European politics, less social democracy, more traditional conservatism." But when it comes to relations with the U.S., he expects no big changes: "The U.S. will continue to be of crucial importance," he says. "The transatlanticists could become even more dominant and leading in the German foreign policy. Merz or Spahn are more likely to deal more easily and impartially with an unpredictable U.S. President Trump than Angela Merkel did in the past, [with her] strained personal relationship with him."